5.7x28 AMMO SHIPS TO YOUR DOOR FOR FREE IN BULK FROM AMMOMAN! 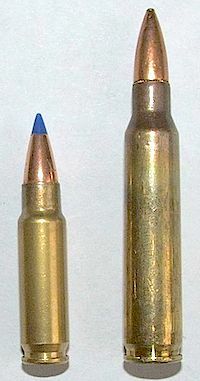 5.7x28 ammo is a relatively small but very fast centerfire cartridge that was developed after NATO requests for a 9mm Luger replacement caliber. About a decade since that development, 5.7x28 is the caliber of choice for military and law enforcement in about 40 countries all over the world. 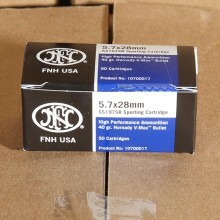 Made especially for FN, or Fabrique Nationale, 5.7x28 ammo is common among military and law enforcement agencies all over the world because of its high velocity and relatively small size, allowing the shooter to carry a lot of rounds. A rimless, bottleneck cartridge, you can find 5.7x28 rounds loaded with bullets ranging from 23 grain to 40 grain. Corresponding muzzle velocities typically fall between 2,350 feet per second for the heavier rounds and 2,800 feet per second for the lighter rounds. Designed to replace the 9mm Luger round, 5.7x28 has fared well throughout rounds of NATO testing, although it has largely not replaced the 9x19 round. Tests found 5.7x28 ammunition was superior to the 9mm cartridge against unprotected targets and equal effectiveness when fired on protected targets. Making the case for NATO adoption even stronger, 5.7x28 ammunition can be produced on manufacturer lines that currently produce 5.56x45 NATO ammunition. Pictured at right, you can see the 5.7x28 blue-tipped round next to the 5.56 round. Despite all those reasons to do so, NATO acceptance and standarization was never granted for 5.7x28. For un-published reasons, Germany largely fought the NATO recommendation to adopt 5.7x28 rounds as standard. Many nations, however, have independently adopted the round for their own use. SS90 Standard Prototype Round: This round was used in the earliest 5.7x28 rounds. It used a full metal jacket (FMJ) bullet and polymer core but was soon replaced by the SS190 variant. SS190 Duty: These rounds offer superior performance to the prototype SS90 round with a steel penetrator and an aluminum core. This ammunition is considered armor-piercing by the ATF so surplus rounds in the United States are tough to find in-stock. SS192 Hollow-Point: Discontinued in 2004, the SS192 hollow point variant had a copper jacket and aluminum core paired with a hollow point (HP) bullet. These were not marked as armor-piercing by the ATF. SS197SR: This round is the most popular among sporting shooters in the United States and is virtually the same as the SS195LF round. These rounds use a Hornady V-Max projectile and is loaded with a blue-colored polymer tip. You will likely find these rounds for sale from Fiocchi. American Eagle AE5729A: Produced by Federal, these 5.7x28 rounds use a total metal jacket (TMJ) bullet and a very thick copper jacket. The casings used in these rounds are actually manufactured by FN. 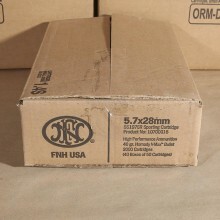 Like all bulk ammo here at Ammoman.com, your order of $99 or more ships for free so it’s always a good time to stock up!